@9 shared this story about Peter Norman. Woah, so inspirational! This conversation with Amitav Ghosh on his latest book The Great Derangement is pretty scary! He says, “You know that this great derangement is ultimately going to lead to a great unraveling, but to see it working itself out, day after day, in the news, it’s so terrifying. I mean, it’s here, it’s happening. You may not see it a direct connection between the events happening in the world today and the climate in general, but that relationship does exist. In Syria, everything started with a great drought. The Middle East, this entire Mediterranean region, is going through a historic drought. And if you think about how this tumult in the Arab world began, it was with protests over food in Tunisia. So what we’re facing really, if you like, is a catastrophic convergence of natural impacts and human impacts.” I ended up buying the book at Bookworm. This IndiaSpend article on how quotas have helped the disadvantaged caste students is a really well written article, with informative charts. Kenneth Reitz released Episode-2 of Import This, a podcast that I wasn’t aware of and ended up listening to Episode-1. I really liked the discussion on being considerate to others in communities that you are part of. The quote that this episode ends with, “Software is all about the people. Don’t dismiss them. Don’t dismiss their experience.“, resonated well with me. 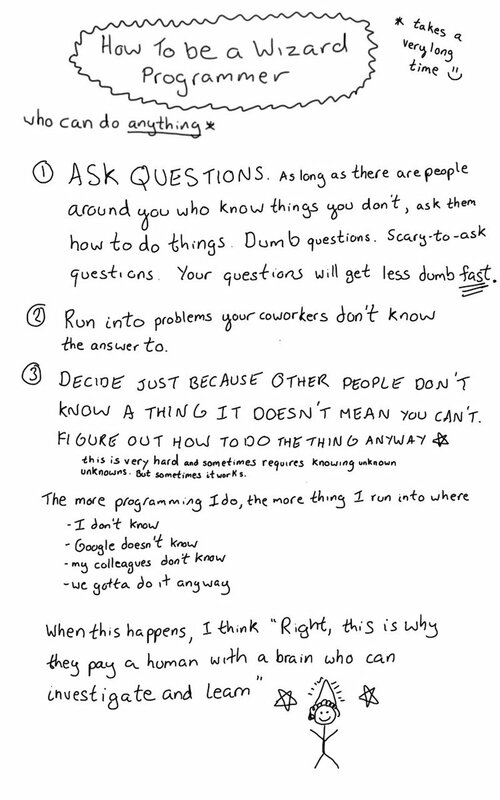 Julia Evans’ how to be a wizard programmer sketch is rad! (tweet). I watched the movie Blind Side (2009) with friends, and really liked it. SJ and Oher together, they are a blast!